For Easter, we got Patrick a few non-candy items for his Easter basket. Nothing against candy, but 1. he's too little to be munching on Cadbury eggs and 2. any candy that I get "him" doesn't go to him, it goes to me and Mike, and we don't need any more candy in our house. So, we elected to get him a few non-candy things for his basket. One of those things was a packet of bubbles. 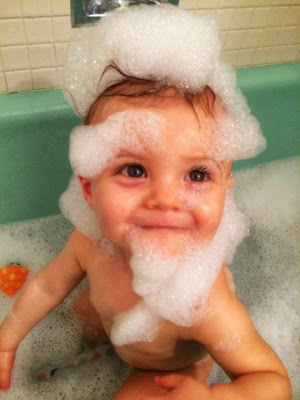 As far as I know, Patrick has never seen any bubbles before, minus those fluffy ones that layer the top of his baths, which, he really REALLY loves. You should hear him squeal and crawl at lightning speed towards the bathroom when he hears the water running. 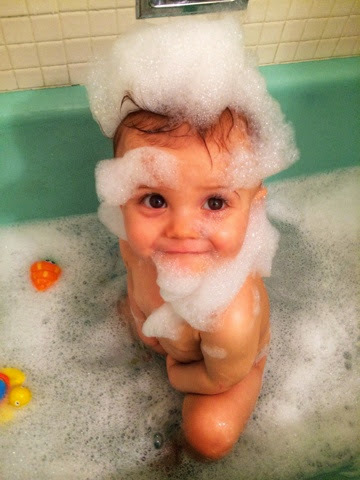 And he'll stay in the bath for an hour (if we let him) because he loves his toys and the bubbles that much. So.darn.cute. I know he loves his bath bubbles, but I wasn't really sure how he'd react to this floating transparent balls sailing around his head. I assumed he'd enjoy them, because he seems to enjoy anything new that we give him or that he comes across. Since Easter was crazyyyyyy busy we didn't get to break open any of the bubbles then. 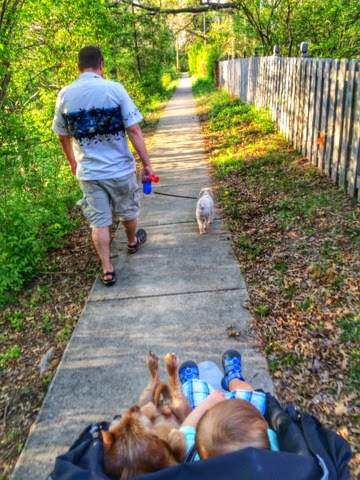 We did get to crack them open tonight after our walk, which, side note, Scooter rode in the stroller with Patrick and Braxton (Scooter's bestie that's staying with us this week while his mama is in Tennessee) and Mike walked. We have the world's laziest dog. When we got back from our walk (and it was an absolutely gorgeous evening, by the way--not a cloud in the sky, a perfect 72 degrees and no humidity. gosh, I hope this lasts!) 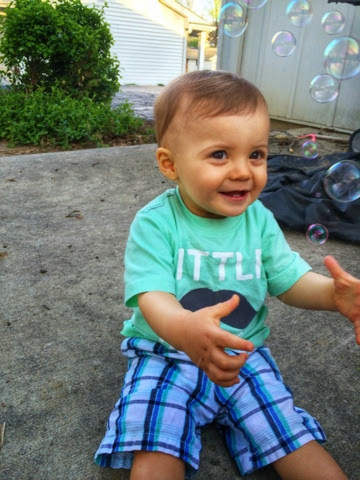 Patrick and I camped out on our back patio and I busted out the bubbles. OHHHH EMMMM GEEEE. Dude LOVED him some bubbles blowing in his face! Seriously. This kid of mine, who won't sit still for more than 2 seconds without trying to scurry away or crawl on top of me (which makes getting good, non-moving yet smiling pictures of him oh-so-hard these days! 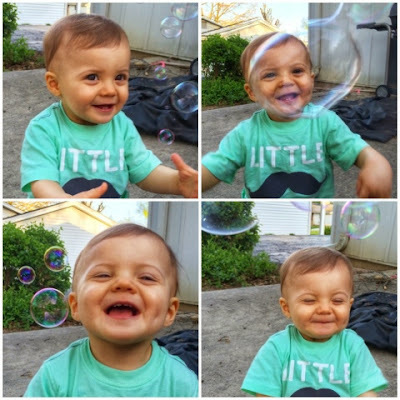 ), was completely mesmerized by the bubbles...and excited. 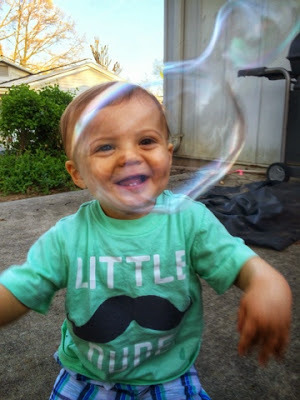 Bubbles are awesome...bubbles in slow-mo are even better. He loved every single bubble that was blown in his face. 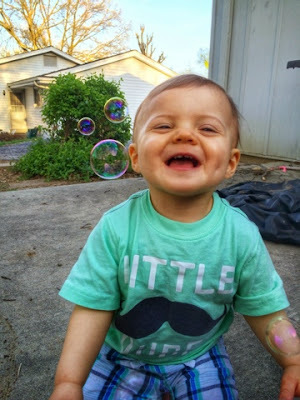 Some he tried to eat, some he let pop on his face (then squealed with excitement), some he'd shut his eyes really tight and just giggle, and others he just watched float and pop over his head. It was so darn cute...and I was so glad I had my iPhone there snapping pictures and videos of his excitement. These might be some of my favorite pictures to date because he is just so happy in each and every one of them. I told Mike we need to make sure we don't overkill the bubbles--I want him to get excited when we do bubble time but not get burnt out because we do it every.single.night. 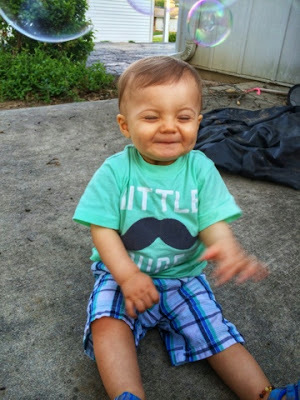 Here's hoping there's lots more laughs and giggles the rest of the spring and this summer from my happy little almost-one-year-old!